I seem to have given up on fiction for a while. Looking over the most recent reads, it’s all been factual. I thoroughly enjoyed Marc Morris’s The Norman Conquest and was going to go straight on to read his book about castles – rather succinctly titled Castle – except that somewhere in between, I bought a copy of Katherine Swift’s book about her time creating the garden at Morville in Shropshire – The Morville Hours – and found myself immersed in a wonderful way that wouldn’t allow me to put it down until it was finished. I had intended to read it when it was first published – am I right, was it serialised on radio at the time? But I never got around to it. I used to drive through Morville regularly at one time, before Katherine took over the garden, so I was intrigued to know more. But this is far more than a gardening book. Oh yes, there is a lot to interest a gardener, but Katherine cleverly arranged her chapters in the form of a medieval Book of Hours, and so, following the turning year, in rhythm with the turning offices of the monastic day, she gives us glimpses of her own life, the history of Morville and people over the ages connected with the area. I was spellbound. I read a review of the book which described its tone as melancholy. I agree, but it felt totally appropriate and I felt sad when I came to the end. I cheered myself up by going back to Castle. If castles are your thing, this is going to please you, but perhaps not the best reference for your thesis on medieval architecture. My only problem with it though had nothing to do with the content, but with the paper it was printed on. The hardback copy I have uses thick shiny paper – very pretty, but dreadfully difficult to read in bed with the bedside lamp – I had to keep moving the pages around to avoid the reflections (I know, never satisfied some people…). I hadn’t seen the TV series which went with the book, but having finally managed to get Channel 4OD to work, I might seek it out. It hasn’t been the best summer for history trips for me this year, so reading all these history books has gone some way to sooth a need, but reading The Morville Hours, had renewed an interest in these medieval books – the Books of Hours – each one a magnificent work of art, combined with a story of the men and mostly women who owned them and used them daily. I love that rich mixture, the sense of connection both with the medieval artists who slowly, religiously, wrote and decorated the pages and with the women in whose hands these very pages were held. I suspect that it’s a similar sensation I get from looking at ancient needlework. So when I was out yesterday on an entirely different mission, and I saw John Harthan’s Books of Hours, I couldn’t resist. It is a book for a history junkie to drool over. 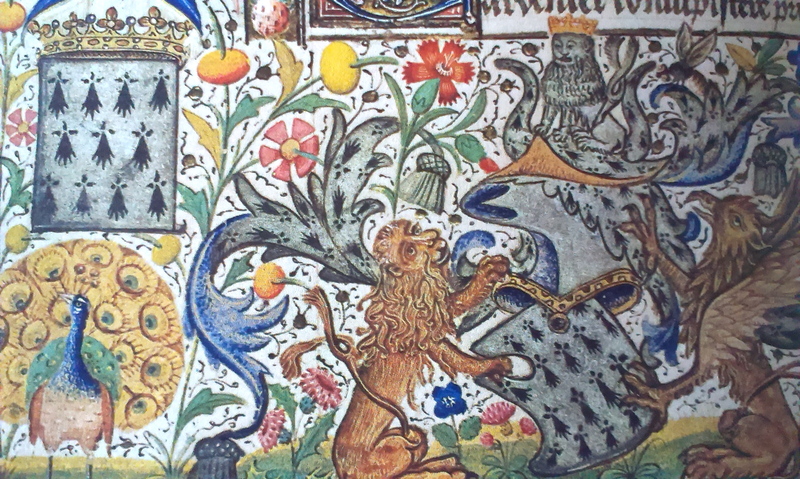 There are many colour pictures from Books of Hours throughout the middle-ages, accompanied by a description of the work and details of the owners. This is just a tiny detail from The Hours of Isabella Stuart, Duchess of Brittany (c. 1417-18). So much crammed into that space – but what I adore, are the little black lines, deliberate, but also free, can’t you just feel your own hand making those marks. There’s much, much more inside – I will have to restrict my time looking at each example or nothing else will get done around here. And then, all my Christmas’s coming together, I also found the Sue Clifford and Angela King book, England In Particular in the Oxfam bookshop in Berkhamsted. (Thanks Sue for the recommendation – it’s even better than I’d hoped). This is another book that could easily keep you engrossed for hours. It’s an A-Z of England and its special ways. I like the blurb that says “…offers a way of looking that makes the mundane magical. It will change the way you see the world”. Changing the subject completely – I’m currently gorging myself on Cox’s apples. My mum craved them when she was expecting me, which is my excuse for eating pounds of them at this time of year. Is it me or are they especially good this autumn? Glad to know I am not the only one who gets their thrills from reading about castles! I need to check this book out. 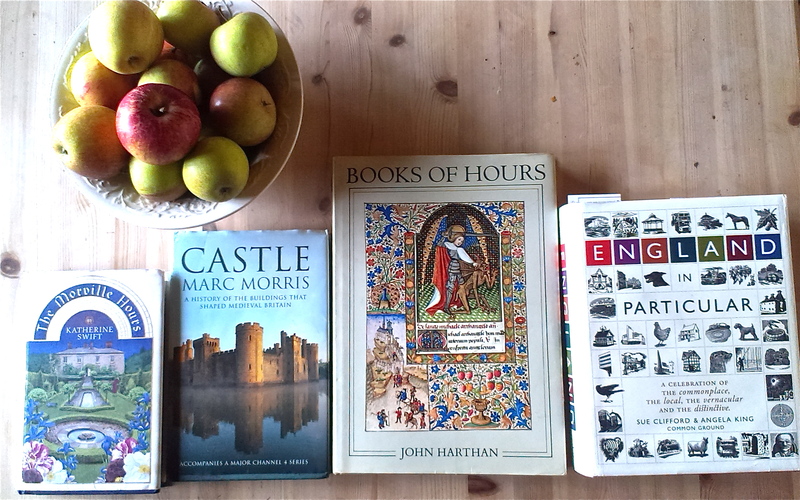 I enjoyed it, but it isn’t what you’d call ‘comprehensive’ – if your castle habit is a serious one, try Allen Brown’s English Castles – buy it second-hand. this middle-aged-working for herself-housewife just came in from her garden….thank you for introducing me to Katherine Swift….i’m intrigued….do you recommend a Kindle version or the actual book? Hi Sonja, good weather for gardening! Well, I’d go online and buy the book second-hand. You can pick a hard-back copy up cheaper than the Kindle price and I think it’s the sort of book you might want to dip into, which I find more difficult with the Kindle. I’m pretty sure you’ll enjoy it. Thanks for popping into my place and leaving me a friendly comment. I adore Cox’s apples too and I can’t always get them over here, b ut when I can I’m in apple heaven! The Morville Hours sounds like a lovely read. I love the sound of all these, Anny! Especially ‘England in Particular’. That sounds right up my street. I can see why you love Books of Hours – it’s almost like tapestry in ink, the illustrations are so intricate and beautiful. Like a meditation in themselves! You’ve got it spot on Jo – little meditations exactly. I love the Morville book too. You are right that it was serialised on the radio with Katherine Swift herself reading it when it first came out. Visiting Morville has been on my wishlist for a couple of years now but hasn’t yet happened. You remind me (in my current mood of trying to find time for myself) that I must do it! thanks for your lovely comment mine. really helpful. Ah, so I was right, it was on the radio – thank you! I’m not entirely certain I really want to see it now – I loved the atmosphere she creates with the book and I don’t know if I’d be able to tap into that on a visit – too much to ask surely – but then again, it would be difficult to pass up an opportunity to go. If you do visit, I’d love to know what you thought. Hello, so delighted to meet you! I’ve just been reading a little over at your blog – especially good timing to read your “why I…” blog-hop post, which I’ve found to be a wonderful way to get to know people online. The Berkhamsted Oxfam shop is brilliant and the people in there are very knowledgeable and helpful too. And yes, quite true, I always find something to bring home with me. It is exactly the sort of book to bring out the medieval in you! BTW Kathy I think my comments at your blog are being eaten by the blogging beast – it seems to be happening on a lot of Blogger sites, could be me, Blogger or Bloglovin – not sure, but if you end up getting the same comment half a dozen times, you’ll know it was me repeatedly hitting ‘publish’!